« The Engineer’s Corner: Rajesh (Steve) Gaur, aka “Rajeezy,” P.E., T.E. This weekend, the Northeast LA Bicycle Friendly Business District (NELA BFBD) is going to get a little more SPINTACULAR! 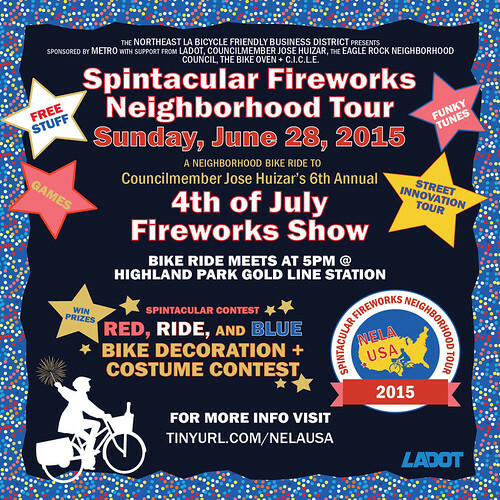 LADOT is a proud partner in the NELA BFBD Summer ride: The Spintacular Fireworks Neighborhood Tour. The ride, sponsored by Metro and led by C.I.C.L.E. and the Bike Oven, will take place on Sunday June 28th from 5:00 – 8:00pm, and traverse 5 miles of Northeast LA’s bustling business corridors, taking riders to Councilmember José Huizar’s 6th Annual 4th of July Fireworks Show at the Eagle Rock Recreation Center for a sparkle-filled evening of bicycles, fun, and games. Riders of all ages and abilities are encouraged to join this spintacular ride! Along the way, riders learn about what makes Northeast LA a special place to walk, roll, and ride… The ride will stop at the York Boulevard Bicycle Corral for a Street Innovation Tour, led by Mark Vallianatos of the Occidental College Urban and Environmental Policy Institute (UEPI). The tour will highlight York’s public spaces and innovative street features. 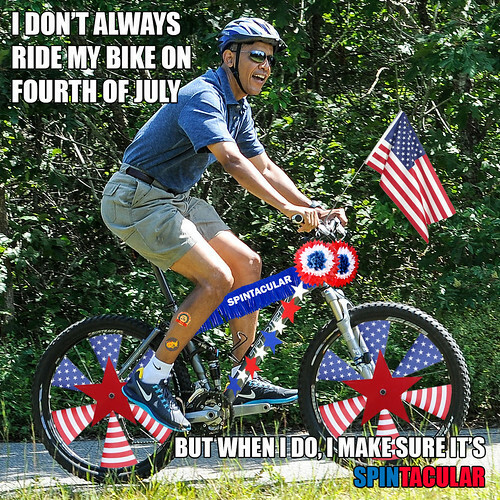 Riders are encouraged to show their patriotic flare on their wheels and beyond in the Red, Ride, and Blue Bicycle Decorating and Costume Contest. Participants will have an opportunity to win even more prizes at the Spin the Wheel Trivia game, testing riders on their local knowledge and Los Angeles bicycle trivia. Ride participants will travel at a casual speed, slowing down to stroll, take in the local scenery, and explore local businesses and culture. Riders should bring a helmet, water, bike locks, bike lights, cash for food, blankets, and jackets for the fireworks show. Secure bike parking and a reserved seating section will be provided at the Fireworks show for Spintacular Riders. The Spintacular Fireworks Neighborhood Tour has been spearheaded by the NELA BFBD Steering Committee of local stakeholders and represents a collaboration and partnership between businesses, the community, and the LADOT Bicycle Program. The primary goal of the partnership is to bring more people to local businesses by bicycle. 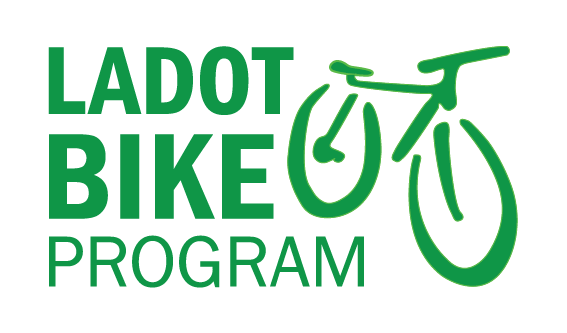 The NELA BFBD accomplishes this by implementing bicycle infrastructure enhancements to the neighborhood like bike lanes, corrals, and repair stations; offering promotional incentives to people arriving by bicycle; and overall, encouraging customers and employees to take local trips to business corridors on bicycles rather than in cars. The NELA BFBD is the first pilot BFBD in Los Angeles and includes Colorado Boulevard, York Boulevard, N. Figueroa Street, and Eagle Rock Boulevard. Councilmember Jose Huizar has been a great supporter of people walking and biking to local businesses and for short trips. The Spintacular Fireworks Neighborhood Tour showcases how getting around the neighborhood on a bicycle can foster community and invigorate economic activity. Events like the Spintacular Fireworks Neighborhood Tour would not be possible without those who have helped plan, sponsor, and facilitate the program. Special thanks to Metro, Councilmember Jose Huizar and Council District 14 staff, the Eagle Rock Neighborhood Council, C.I.C.L.E., the Bike Oven, Occidental College Urban and Environmental Policy Institute, LA River Corp, and the Los Angeles County Bicycle Coalition.